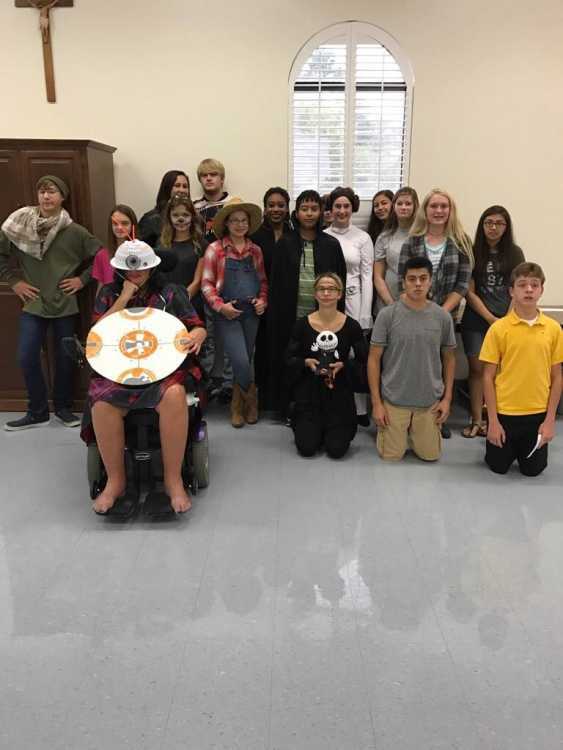 Holy Angels Youth Group of Dyersburg, Tennessee. Today and this week my devotion has had many mini biographies of strong women: Rosa Parks, Sadako Sasaki, and Sarah & Angelina Grimke. As a history teacher students, you know I love this. It amazes me at the strength of ordinary people have the strength and wherewithal to accomplish such extraordinary feats. There's a huge underlying theme that spurs humans to risk their hearts and lives for the greater good of humanity. Are all these persons of one particular denomination of church? No, not at all. Remember, I'm reading a Catholic devotion pamphlet each morning. It's the first of many sources I read from each day. Here's what I LOVE and have always loved about the Catholic faith. It's inclusive. This pamphlet includes inspiring people from all walks of life. The Catholic faith embraces diversity. My heart is broken when I hear other denominations spout myths and untruths about us especially in this area in which I live. Pope Francis is showing the world that God is simply love. He is being led by the Holy Spirit. It makes me proud. Our area needs some education on the Catholic faith. Where there is ignorance, fear abounds. Please educate yourselves and like Marin Lawrence says, "Why can't we all just get along?" Now, let's debunk some of the myths about the Catholic faith. Actually, they were the first Christians. Other denominations are off-shoots from the Catholic faith. Catholics do not worship Mary or statues; they worship God alone. Instead, they "venerate" Mary, which, according to Google, is just a fancy word for "regard with great respect." Similar to how we would show great honor or respect to a King or Queen, without actually worshiping them. Catholics hold them in high esteem as good examples of how to live a faithful life. Statues aren't worshiped either. Instead, they are used as decorations to help Catholics remember people who have gone before, similar to how you might put pictures of your friends and family on your wall. You look at them, you remember them, but you don't worship them. The Catholic Church does NOT teach that people are saved by their works--the catechism of the Catholic Church actually specifically forbids this notion--but rather that faith alone isn't enough. This Catholic belief is actually 100% Biblical, and is even taught by some highly respected Protestant/non-denominational pastors. The books that are currently in the Catholic Bible are the same books that the church has always recognized as being in the Bible. It wasn't until the 16th century that Martin Luther and the Reformers took seven books out. And of those who become priests the usual way and aren't allowed to get married--not all of them even want to be. Priests know what they're signing up for. No one is making them be a priest. They have a choice between God and a wife, and it is their choice to make. No one is forcing them to choose one or the other. I haven't heard this one in real life, but apparently it's popular. Catholics do not re-crucify Jesus at Mass. Instead, they believe that Jesus and the crucifixion occur outside the limits of time, and so when they celebrate Mass, they are only making the sacrifice (which has already occurred) "present" on the altar. While Catholics believe their religion is the one true religion and the ordinary means of bringing people to salvation, they recognize that God can use any means He wants to to bring people to Himself, including those other than the Catholic church, especially if the person has never had the opportunity or knowledge to join the church. They believe that Protestants who have no reason to suspect their beliefs are incorrect can go to Heaven as well as well as Protestants who were planning to convert but hadn't done so yet. Yes, the Catholic church had a huge and horrible scandal lately in which some priests were molesting children. This was absolutely awful and shameful, and they will have to stand before Jesus for what they did. But if you look at the statistics, however, only a very small minority of priests were involved, and it isn't really fair to blame the entire Church or dismiss the Church's core teachings for what a few did. Scandals like this happen in EVERY church and in every city. That doesn't make everyone guilty of the crimes of a few. The church isn't anti-anyone. They do believe birth control is morally wrong--the same thing every denomination believed until 1930. But when pretty much every other denomination began to change its mind, the Catholic church held its ground, and they continue to do so today. They also don't allow women to be priests, which has upset many. But if you look at their rate of women in non-priest leadership positions, it is WAY higher than average. The Catholic church may not do things the "feminist" way, but they do hold women in very high esteem, even referring to them as the "crown of creation." That's pretty special if you ask me. Myth #10: Wearing or displaying a crucifix is idolatrous and a sign that Catholics want to focus only on Jesus hanging on a cross and not on his resurrection. Yes, Catholics prefer a crucifix over an empty cross, but not for the reasons many evangelical Protestants and others suspect. Catholics see victory in the cross. It was through Jesus' suffering that we are saved. Why would we want to pretend his suffering never happened? The resurrection could not come about without the crucifixion; the two are eternally linked. For Catholics, the crucifix is not something to idolize or something to look at in fear. It is a sorrowful reminder that our God died for our sins and then rose from the dead, opening the gates of heaven. Catholics know that Jesus is risen, something we celebrate at every Mass, but the suffering of the crucifixion can never become a footnote to the glory of the Resurrection. So today students, hug a Catholic. Lol! We are just Christians trying to put our light into the dark world like all the other Protestants in the world. Dedicated to Holy Angels Parish of Dyersburg, Tennessee. What a wonderful body of Christ you are. Happy Halloween from my Youth Group!! !